Rooted in Nature. How gorgeous is this tree from the new Rooted in Nature bundle? I love all of the images in this set, but this tree might be my favorite (or, at least, until I work with the other images). There’s such a calmness to the design and height of the tree, so I wanted a similar zen-like feel on the rest of my project. This layout and these colors helped me to achieve the exact look I wanted. 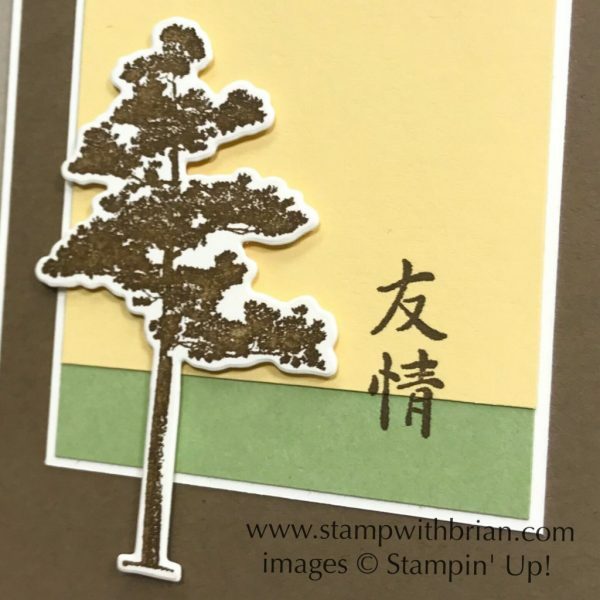 Here’s a look at Rooted in Nature: I’ve been playing with this tree, this sentiment from Artistically Asian and these colors for a week – the project pieces have moved around on my table with different layouts and shapes. I was just patiently waiting for the right way to showcase it. This week’s sketch was my answer. The Make a Difference stamp set featured on this card is available in two of the Share What You Love bundles – and the Share What You Love Specialty Designer Series Paper is only available in one. Be sure to check out the Early Release items that are currently available to customers. I’m so excited we get to share this suite with you – so many great products in these offerings. Click on the image below to take a look at the .pdf promotional: To read more about this new promotion, CLICK HERE. Wow, beautiful card. Somehow, I’ve missed the Artistically Asian stamp set. It goes so well with the large tree. Good match! So cool with the color blocking. I love the “friendship” sentiment! Thanks, Mary! This color combination is so calming – seems to go well with the images. Glad you like it! I like how you tied the white mattes in with the white background of the tree! Great take on the sketch Brian! Thanks, Dawn! That’s a common “trick” of mine. I, too, love the unity it creates on a card. <3 Thanks! Love your mating …a very sweet soft card! Thanks so much, Windy! There were many iterations before I got to the one I loved. Glad you like it. This card is beyond beautiful! I love the color blocking with the earthy colors and the tree! The sentiment is perfect! Love love love it so much!! Beautiful card with an Asian touch. Great job! Can’t wait to see the new catty. Enjoy your day! This is a “knock your socks off card” for sure. Using the white to frame the layers is fabulous and adding dimensionals to the tree is the absolute perfect touch to bring it to the forefront. Just gorgeous! Thanks so much, Grace! I appreciate your kind comments. Brian, this is such a beautiful card!! Makes me want that set now!! Thanks so much, Debbie! <3 It's a great set! Hip Hip Hooray! Framelits for trees that aren’t just for Christmas! I am one happy camper! Oh, I love how peaceful this feels! Great take on the sketch! I love the richness of these colors together and your interpretation of the sketch! Beautiful card, Brian! <3 Thanks so much. I'm glad you like it, my friend. Very cool card, Brian. I love the layout and the Asian vibe, especially the awesome sentiment.